SNDR, specialist in textile reconditioning for over 25 years, is one of the leaders in ready-to-wear logistics with more than 8 million items processed per year. Located in Besançon, the SNDR group called on TRANSITIC for a new installation in order to optimise its intralogistics and ensure the future growth. In order to increase the conditioning capacity, SNDR decided to replace the existing steaming tunnel which no longer allowed it to keep pace with production. TRANSITIC installed the brand new “Cotton Care" finishing tunnel, produced by our partner VEIT. Exclusive to the French market, this new generation of “Cotton Care" tunnels is much more efficient, with a 20% higher output compared to existing tunnels, as well as a reduction in steam consumption of more than 30%. The “Cotton Care" tunnel allows for faster production, due in part to its pre-vaporisation technology that makes steaming easier. 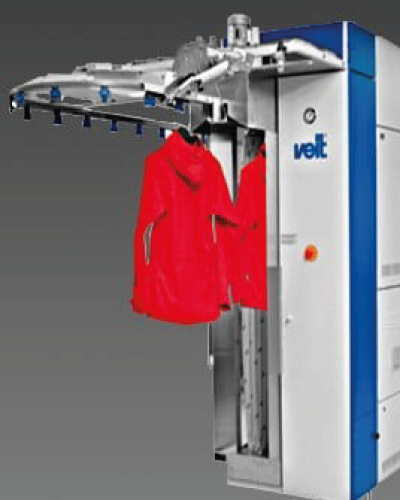 In order to keep up with the pace of the tunnel, a new-generation POLYPACK garment bagger was integrated. This new application allows the company SNDR to repackage 1,300 pieces / hour.